I spent part of Sunday afternoon looking through a patch of clover and searching for a prized four-leafed clover. 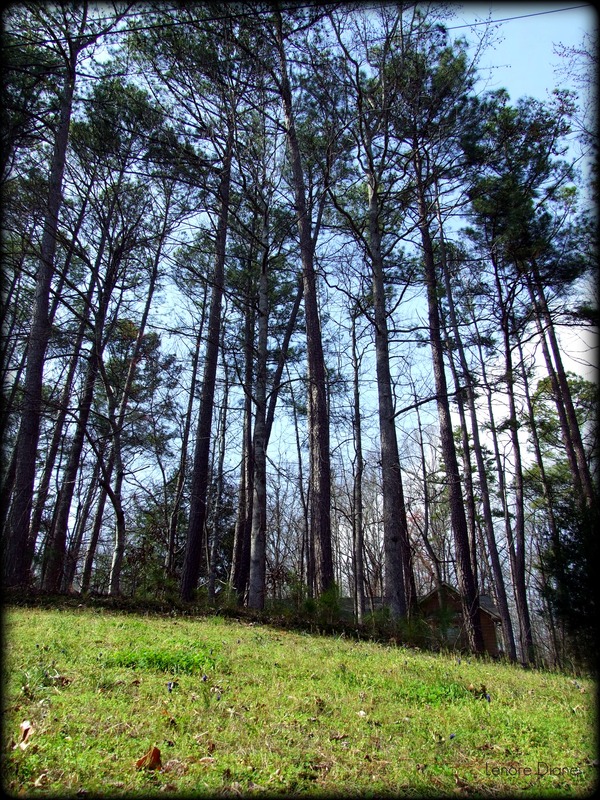 Though I did not find any four-leafed clovers, I did enjoy the blue sky, gentle breeze and slowly swaying pines. Happy Tuesday. May you find the luck of the Irish this week, as St. Patty’s Day approaches. Seriously. Now save your money so you can visit. Are those lob lolly pines? So tall! I don’t understand why I found them as a child, but can’t as an adult. Is this magic only reserved for children? Bring child along on your search for the 4 leaf clover. Lob Lolly Pines? Is there such a thing. I am arbor-ignorant. (smile) I will confirm their tallness, though. Very tall, indeed. Joe found a four-leaf clover last month. I flattened it and taped it to a piece of paper. He keeps it by his bed. Cutie. The trees are so tall and straight really nice photo, looks a lovely spot as well. Yes St. Patrick’s Day is nearly here, the year just seems to be flying by. Thanks for the kind words, Mags. I always appreciate your visits. Your pictures are always so perfect. I would have to take 100 pictures to get one really great one. I haven’t found a 4 leaf clover in years, but like Georgette, found them as a child. Oh K8, if you knew how many pictures I took. Digital cameras make picture taking easy. I will literally snap 10 – 20 photos of the same thing. Then, I go through each and every one to find the best. I am glad you liked the one that made the cut. (smile) Keep looking for the four leaf clovers. You’ll find one. I know it. Good eye, Maxi. While I wasn’t in the backyard, I was sprawled on the street, enjoying a different perspective of the world around me. Glad you liked it. I love the sound of the wind through a stand of pines. What lovely, tall trees. It may not be officially spring yet, but it’s in the 60s today, so I’ve got spring fever. Thanks for taking me out in the woods with you! Spring is around the corner, Peg! Promise! I just hope the heat of Summer doesn’t come quickly. I like the ‘in between’ weather. The swaying of the trees is lovely to watch, provided the swaying isn’t too much. 🙂 Thanks for joining me in the woods. Another fantastic pic, Lenore! You perfectly captured their height with that shot. You are good! Thanks, Darla. I was literally sprawled out on the street. It was fun looking from that perspective. Glad you liked it. I don’t think I’ve ever found a four leaf clover. And I’ve looked plenty! One summer, my sister found about a dozen of them, in the same spaces I was looking, but I guess she has more Irish in her than me (not genetically possible, but it’s the only explanation I’ve got!). I will hold out hope for you to find yours soon. Hello Melissa! Thank you for visiting. When I was a kid, my sister would find the four leaf clovers so fast. I would always get upset. My son found a clover last month. (Did I mention that fact already?) I’ve looked – still no luck. I think I did find at least one in my lifetime. I’m not worried, though. I had such a relaxing time looking through the clovers on Sunday. I may have tapped into a new ritual. Thanks again for visiting!